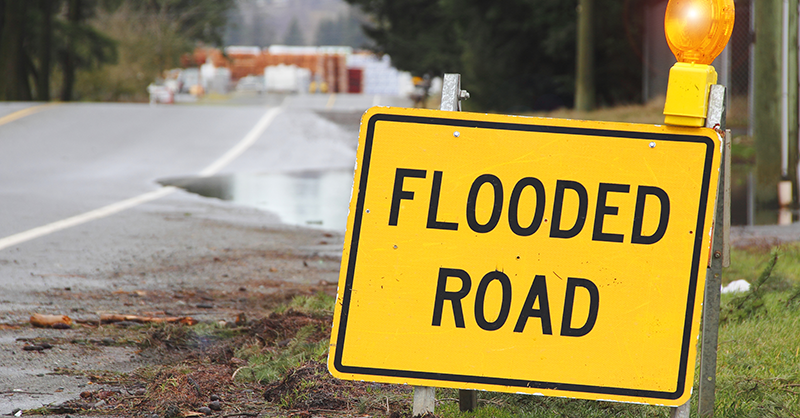 Floods are a common occurrence in Canada, and drivers may be tempted to forge ahead when faced with a flooded road. Yet, the Public Safety Canada has some life-saving reasons to fight that urge. “Do not drive through flood waters or underpasses. The water may be deeper than it looks and your car could get stuck or swept away by fast water,” according to the agency. One of the most common mistakes? Underestimating the depth of water. Severe downpours causes floods, but heavy rains aren’t the only cause of roadway floods. The existing infrastructure may not be capable of handling the flow of water or ongoing construction may impede water flow. Turn around, don’t drown. Don’t risk it. Make a U-turn and head for dry ground. Look for warning signs posted on the roadway. Yellow caution signs are placed in flood-prone areas, while pink signs are placed by road crews at the site of an existing flood. Monitor weather reports. Avoiding unnecessary errands when flash flood warnings are issued. Never drive or walk on flooded roads. As little as a 30 centimeters of rushing water can sweep a small vehicle away. Sixty centimeters of moving water can wash away most vehicles.